Alumni events in New York and Washington, D.C. The day after the Alumni Homecoming Weekend, I was on a plane to New York! Still hyped up on all the excitement in Lund during Homecoming, I was looking forward to meeting even more alumni on the East Coast! 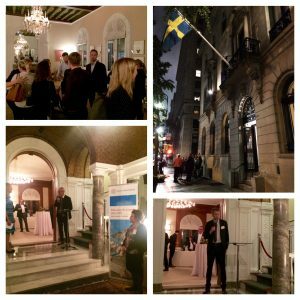 On 24 October, the Consul General Mr. Leif Pagrotsky invited Lund University alumni to the Swedish Residence in New York City for an evening reception. Alumni listened to presentations from Jesper Falkheimer, Head of the Division of Research, Collaboration and Innovation, and Roland Andersson, Vice Dean at Lund University’s Faculty of Medicine. 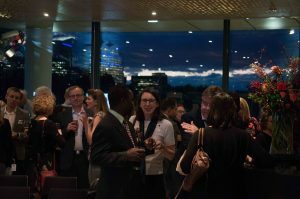 It was an evening of full of networking and reconnecting with alumni in the area! If you’re an alumnus/alumna in the New York area, please feel free to get in touch with us with any ideas about future events in your area. Email info@alumni.lu.se. The next day (25 October) we hopped on the train down to Washington, D.C. and that evening was the Sweden Alumni Reception at the House of Sweden. 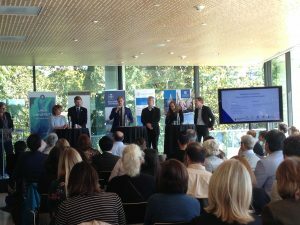 This event at the Embassy of Sweden was for not only Lund University alumni, but also alumni from Stockholm University, Umeå University, University of Gothenburg and Uppsala University. We were welcomed to the embassy by the newly appointed Swedish Ambassador to the United States, Karin Olofsdotter, who is also a Lund University alumna. 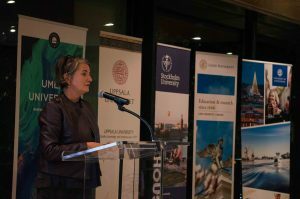 On 26 October, the Embassy of Sweden hosted research seminars with these five leading Swedish universities on the topics of cancer, sustainable development and inclusive labor markets and societies in the age of migration. This also took place at at the House of Sweden. In the morning, Professor Roland Andersson, Vice-Dean at Lund University’s Faculty of Medicine, gave a talk on the challenge “How to cope with future cancer management”, as well as “Unmet needs in future oncology”. He further participated in the panel discussion on these topics. In the afternoon, both a Lund alumnus, Matt Banks, and Lund University Associate Senior Lecturer at LUCSUS, Torsten Krause, were on the panel for “Sustainable Development – From Local Choices to Global Impacts”. Lastly, Mine Islar, Lund University Associate Senior Lecturer at LUCSUS and Project Director for Transdisciplinary Approach to Migration Research at the Pufendorf Institute for Advanced Studies, was on the panel which discussed key questions related to the inclusion of refugees and other marginalized groups into the labor market in their country of residence. Alumni in the area had the privilege to meet with these researchers and university representatives during their D.C. visit. It was a fruitful visit and a pleasure to meet with passionate alumni in the area. This entry was posted in Alumni Events. Bookmark the permalink.